Over the past 24 months Imagitech has invested heavily in the development of training tools designed to assist learners working towards professional LGV and PCV licences prepare for their theory and CPC Module 2 tests. 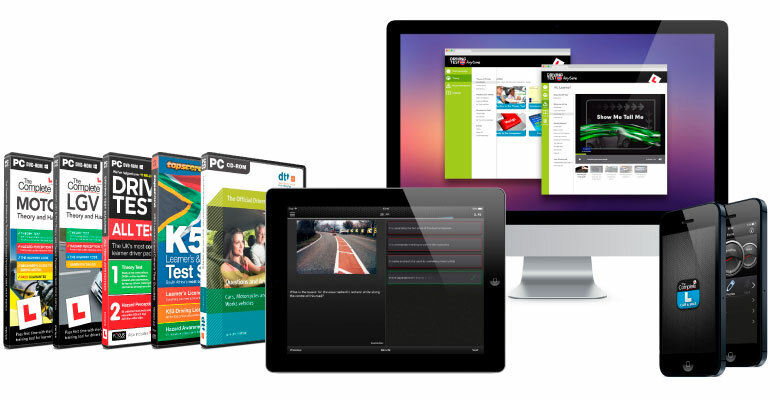 Imagitech's training tools contain all the official DVSA learning material. This is complemented by learning material unrivalled in quality and depth for the CPC Module 2 test as well as for Hazard Perception. This fantastic content is available via Imagitech's apps under the brand "The Complete" (see also www.learn2app.co.uk). We offer dedicated theory apps for LGV and PCV theory, an app specifically designed to help candidates prepare for the CPC Module 2 test, and an app offering access to hundreds of hazard perception clips. Within iOS these are also combined to create a bundle offering significant cost savings to the end user. In addition to the apps that same outstanding training content has been made available to training organisations and trainees via the online training resource DTS Anytime (see also www.dtsanytime.co.uk). This system is based on Imagitech's Fast Track® technology and supported by Imagitech's dedicated support team. It complements the training content with sophisticated trainee management and reporting facilities. Together with our long-term partners Focus Multimedia the system is now in use by the leading training organisations in the UK. Dr Mike Bews, technical director, said: "This success shows once more what can be achieved when we combine outstanding content with a robust and user friendly delivery system - be that the apps or online via our Fast Track® technology underlying DTS Anytime. Teaming up with Focus Multimedia has allowed us to harness the potential in this marketplace by concentrating each on our core competencies - technical for Imagitech, marketing for Focus Multimedia. We see this success as a blue-print to future collaborations with our existing and new partners..."
Imagitech is currently looking to expand the range of training material that can be made available using the online training management and delivery systems as well as dedicated apps. Imagitech Fast Track® and Learn2® technology has now been on the market for well over 20 years. The approach forms the building blocks for many products designed to help Imagitech's customers prepare for essential and popular tests - including learner drivers across several countries and candidates for the Construction Skills Health and Safety exams. The ongoing success of Imagitech's software is testimony of the uncompromising focus on quality and customer needs together with world class end user support. Well-known brands supported by Imagitech's systems include Driving Test Success, The Complete Driving Test, DTT RSA, Topscore® and CITB. Dr Gerhard Manogg said: "When we set out to produce our technologies Imagitech Fast Track® and Learn2® we never dreamed they would perform as well as they have, or would cover as many markets and subject areas over such a long period of time. This success is a credit to the developers of the system, who produced a product that is second to none in terms of robustness, reliability and user friendliness. We work very closely with our partners who help us to market and distribute our products, and to ensure that the content and the functionality of the software is always the best available on the market." Imagitech are actively working to expand the content areas that the technology is applied to, both with existing partners and new. As part of the annual re-release of CITB's revision apps Imagitech has implemented additional question types into the Imagitech Fast Track® and Learn2® technology. The available question types include drag and drop of text or imagery in addition to the more classic multiple-choice question type. All questions can optionally be delivered with multi-lingual voice overs and additional media clips, making Imagitech software ideal for the creation of highly interactive training and exam practice material. Dr Mike Bews oversaw the development and implementation of these new features and said: "The new questions types represented a real challenge in terms of their implementation: The user interaction had to be intuitive and user friendly - and work across all platforms taking into account touch screens and mouse driven interactions. We are extremely pleased with how the user experience turned out. This has been made possible through the close collaboration of our software engineers working across the platforms and graphic user interface design specialists." Imagitech continues to look for new opportunities in exploiting these additional question types and is actively seeking new partners for the development of additional learning material. Imagitech has recently developed and launched a new content management and distribution system coupled with content readers targeting many platforms. This technology now facilitates the dissemination of CITB's HS&E Publications. Imagitech's solution is used to access to the main publications as managed by CITB and ensures that all subscribers can not only search and navigate the material easily, but also that any updates to the materials are automatically made available to all subscribers. The system consists of a secure content management server to control access to the content, coupled with custom written reader apps available for several platforms: iOS and Android devices, as well as Mac and Windows computers. End users simply register their subscriptions by entering their account details into the app or application of their choice - and everything else is taken care of. Dr Mike Bews said: "We are very pleased to see that this new system has been accepted very quickly by the users. The development was completed within a tight time-schedule and was available across all platforms within budget. The commercial success of the content management system is a credit to our development team as well as our uncompromising focus on quality and design. This focus sets us apart in the market and ensures that all our products are successful in the short and long term." Imagitech has developed the technology completely in-house and now continues to work with its existing partners to expand the portfolio of publications supported by the system. In parallel Imagitech is looking for new partners to facilitate the dissemination of further publications. Over the past few years Imagitech's product portfolio has expanded dramatically. We now offer specialist applications across several platforms, including iOS, Android, Mac and Windows, as well as secure web applications for training and assessment purposes. Due to the wide range of specialist skills available within Imagitech, our products cater for all requirements: Secure online access to data and updates for apps and applications, standalone software for all platforms, integrated systems designed to exchange data securely with third party systems, and web based systems accessed via standard web browsers. This breadth of knowledge is put at the disposal of our clients and end users, providing secure and user-friendly products for a large variety of purposes. Dr Gerhard Manogg said: "The strength of Imagitech lies in being able to combine many specialist skills under one roof - technical, graphical as well as media handling and editing. Whilst we offer such a broad set of skills we remain a small, nimble and flexible organisation. In this way we ensure that the needs of our clients and end-users are always prioritised by developing novel solutions, to tight deadlines and limited budgets." Imagitech always looks for long term mutually beneficial collaborations with new partners.